I want to share some veteran resources that continue to strengthen both soldier and spouse. The Combat Trauma Healing Manual is a great book for individual reading or a small group setting. 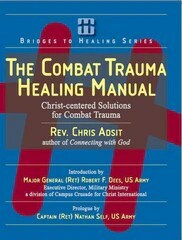 The author, Chris Adsit, brings out Christ-centered solutions for combat trauma. He is practical and telling in his approach. While many authors may simplify PTSD solutions to coping strategies, changing behaviors, and cognitive therapy, Adsit shares that more is available. God wants to bring about restoration, stability, and healing. I feel that this book is written with an attitude of gratefulness for veterans and a desire to bring peace to military homes. It gives an appropriate spiritual approach that veterans need to hear. This is the companion book for military spouses. It is written with the same amount of care and concern. Each time that a warrior comes home, the time and type of reunion is different. One constant is the spiritual comfort that God can provide to military families. PTSD will complicate how couples reintegrate at home, but military spouses will find stories, suggestions, and learn how to deal with new situations. The book is also wrapped with advice from the medical and counseling community that is extremely helpful. 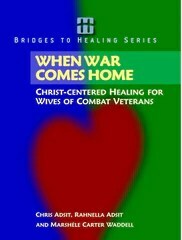 The personal stories and recommendations make this book worthwhile for both veterans and spouses. You can find both books and additional information at http://www.militaryministry.org/.